Disclaimer: I'll definitely be over-simplifying here. The pesky details and the nuances aren't really that critical and I don't want them to distract from the main issue. Java is a programming language that's not natively supported by browsers, but when used on websites, requires the download and installation of a "Java Virtual Machine" or JVM, now more commonly referred to as the Java Runtime Environment (JRE). Programs written in Java are typically compiled into an intermediate form that is more efficiently executed by the JRE than the original source would be. As such, Java programs are typically separate downloads referenced by, but not actually included within, web pages that happen to make use of Java applications. Java programs are not limited to being embedded in web pages or other containers. There are many standalone applications written directly in Java that run and execute like any other program and may not be related to the web or internet at all. Fundamentally, Java is just another programming language that can be used for almost any purpose, only one of those purposes being embedded into web pages. Regardless of where or how it's used - embedded in a web page or as a standalone program - it's the same Java Runtime that's used in each case. Java must first be downloaded and installed before it's available for use in either web pages or standalone applications. Once downloaded, there's often no real indication that a standalone application is using Java. 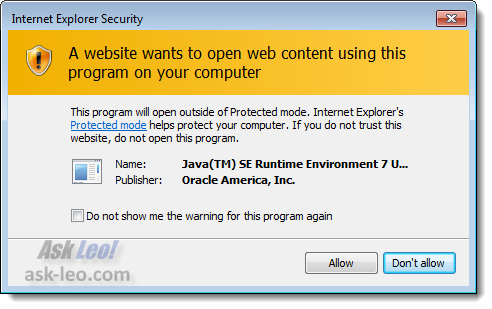 Browsers will often often ask for permission before running Java on a web page. In Windows, Java is a separate application on your computer. It includes its own update functionality and automatic check. If Java is installed, you may also find a Java control icon in Control Panel that will allow you to check for updates immediately. While a similar setting exists in Firefox, the best approach is to use the NoScript plugin to control scripting on a site-by-site basis. 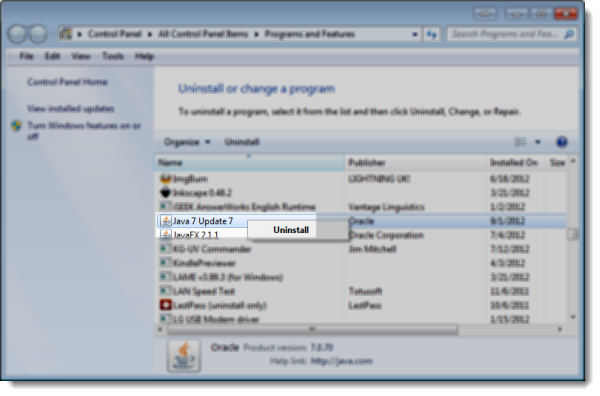 Simply locate Java in the list of installed programs, right-click on it, and select Uninstall. This is safe to do, even if you regularly visit a website that required Java, as the next time you visit, it will automatically prompt you to re-download and install Java. If you prefer not to have Java installed, you can decline and that website's Java-based functionality will not be available. 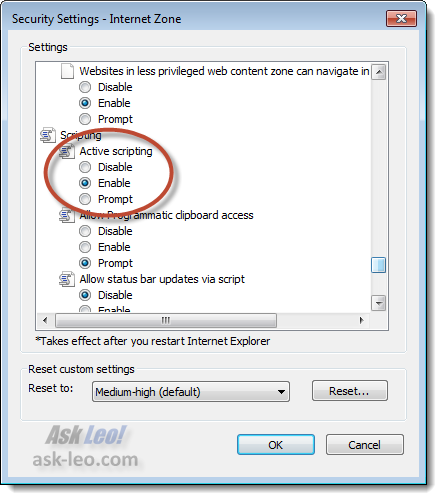 Web browsers can also disable Java without needing to uninstall it, typically using settings in the browser's advanced options, but in general, uninstalling is by far the easiest approach. Java: Uninstall Java unless you're certain you need it. It's not at all uncommon to end up with Java installed because of a website you visited only once. Uninstall it, and if something you care about breaks, re-install it. In this case, some security-minded folks recommend having it enabled in only one browser that you don't use regularly and explicitly disabling it in the browser you use day-to-day. As for me, I just uninstalled Java. I know of only one program that I use that may eventually require it2. Until then, I'll run without. Java (programming language) - Wikipedia - more details including a history of Java's origins. JavaTester.org includes additional background on Java, as well as a Java version tester if you have Java installed. What is Java and what will happen if I uninstall it? When we say "Java," it can be two completely different things. First, we have to decide which you are talking about. What is Java? Java might appear on your computer, but it's nothing to worry about. Java is a programming language that likely was used by a web page you visited. When I heard about the vulnerability, I decided to uninstall Java 7 and go back to 6 (I have a proprietary program at work I must use that is written in Java). Both versions 6 update 22 and version 7 update 5 were in the 'Programs and Features' part of control panel to uninstall. I unintstalled version 7. When I open the Java control panel, it say Java 7, but the version is 1.6.0_22-b04. I find that to be very weird. I'm considering uninstalling it also then reinstalling version 6 from scratch. There is also a JavaFX 2.1.1. Should that be uninstalled? I uninstalled all of the above with no ill effect. All of your posts have posted. Try refreshing your browser and see if clearing the cache that way works. Many thanks for this explanation as it has confused me for a long time. Unfortunately, I am an old widowed senior living alone, and worry about mental deterioration. [we seniors worry about such things] So i play a lot of Sudoku and crossword puzzles every day to exercise the mind. All of them seem to require java and flash. So, I'm stuck with them, but use the FF update links to maintain the most current versions. Today I just got a notice to download a java critical update. However, they thought it is not ready to be released until October. In any event I have removed the Java 6 that I had on my system. Should I download this new update? Oracle performed an emergency update due to this problem. Unfortunately the update has other problems and most security minded folks will recommend uninstalling Java unless you actually need it. Java is the second worst culprit as far as vulnerabilities are concerned, so its absence may indeed be desirable. Next, documents are increasingly being used for nefarious purposes, while in comparison, Flash might be considered relatively safe nowadays. Updating Java should have updated the plugins, but you should be able to get all at java.com.